Clear-Com Encore™ Partyline Systems offer unsurpassed 2-wire, group communication capabilities. This platform offers an intuitive plug-and-play design, superior audio clarity with the embedded “Clear-Com Sound”, and reliable communication technology for the most demanding applications. 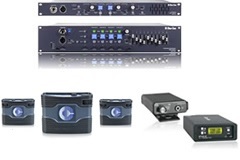 Trusted by thousands of audio experts around the world, Clear-Com Encore analog partyline systems are the communication backbone in theatres, schools, local broadcast stations, churches and other small to mid-size live productions.